I'm no expert by any means but I'd like to start off with some basics for summertime catfish fishing. First off, a little fact.... there is no such thing as "catfishing". The correct way of saying it is "catfish fishing". OK now that we got that out of the way we'll be going over everything you'll need in your arsenal this summer to target those monster blue and channel catfish @ your favorite local lake! There is nothing like the sound of the clicker on a baitcaster screaming away as a catfish takes off with your bait! Catfish are a smarter fish than most think and when they first pick up your bait if they feel the slightest bit of resistance they will drop your bait just as fast as they picked it up. Unless I'm fishing with circle hooks I always leave my bail open so when that cat picks up my bait and takes off with it he/she won't feel any resistance. I like to use a baitcasting reel big enough to hold 20lb test mono for one reason, the clicker. When fishing for cats at night with an open bail, having that clicker engaged you immedietly know when your getting bit. Close the bail, set the hook, and the battle is on! Bass Pro Shop makes the perfect low cost baitcasting reel called the "Megacast". It cost under $30. It comes in a 12lb and 16lb version, your going to want to go with the larger 16lb version. FYI.... this is also the perfect reel for leadcore during trout season. Blue and channel catfish can grow up to and over 100 pounds! You never know when that catch of a lifetime might find its way on the end of your line so its best to come prepared to the battle. I like to use a 7 foot, medium to heavy (10-25lb test) rod. Shakespeare makes some Ugly Stiks that are under $40 that are low cost but durable rods for catfish fishing. Catfish mostly use their powerful scent when feeding thus there is no reason to go light on line. Keep it simple and go with some 12-20lb test mono. I like to use IzorLine because it is cheap. You can buy a large spool of it for under $20. Some people even like to use braided line while fishing for catfish near structure because of its abrasivness but it is harder to and won't cast as far as mono. If you do choose to go with braided line pick your favorite 20lb test braided line. Like I said before if that cat feels the slightest bit of resistance its going to drop your bait so your going to want to flyline your bait. In most cases you don't want to add any weights to your line as it just adds resistance. Flyline means to tie your hook, lure, etc.... directly to your line with no weights, swivels, etc... ahead of it. All you need is a simple bait (J) hook. The most important thing here is to match the size hook to the size bait you are using. I mostly fish with a 2/0 hook when fishing for catfish but when I decide to throw on a larger piece of bait I'll use up to a 5/0 hook or in some cases even larger. Just remember, make sure the cat has your bait then close your bail and set the hook! Circle hooks are an almost entirely differently way of fishing for catfish that is quickly "catching" on but I'll be covering that including the gear you'll need to do it in a future tutorial. From cutbaits like mackeral, bonito, and skipjack, to hotdogs and powerbait, catfish will eat just about anything. But make no mistake about it there is nothing like some bloody, oily, fresh cutbait. Mackeral is my favorite to use as they come in the perfect size to cut up and use as bait. I like to chunk my mackeral into 4-6 (2") sections from the tail to the head. DON'T THROW AWAY THE HEAD! The big cats love them! Hook the chunk of mackeral one time making sure to leave the tip of the hook exposed. If using the head hook either the top or bottom lip one time again making sure to leave as much of the tip of the hook exposed as possible. You can also use chicken livers, shrimp, and live nightcrawlers when using this method of fishing. I'll be going over some other bait and rigging options in a future tutorial covering bait. FYI, another reason I love to use fresh cut mackeral is you can go to just about any pier in California and fish for free and catch your own free bait. It is a fun summer activity that I will also be going over in futher details in my future tutorial covering bait. Stay tuned for future tutorials covering topics like, location, fishing with circle hooks, and baits. The most important thing this summer is to get out there and fish! You won't get your shot at the catch of your lifetime if you don't get out there and fish! I hope to see y'all at one of my favorite local lakes this summer enjoying in the fun of targeting monster blue and channel cats! Last edited by TaperSteve; 05-28-2012 at 09:40 AM. One bit of clarification here, catfish actually have decent eyesight. Most people have been taught that catfish are bottom-feeding garbage disposals. In reality they are very active predators, and even smash insects on topwater from time to time. In really clear water, catfish can be really cautious because they can get a good clear look at your bait. I've had some big channels steal bait from me, they can be really good at it. I'll second this comment, I learned that one reason why catfish spend so much time on the bottom is because there not buyont(forgive the spelling) so the immediately sink to the bottom. Don't know how true it is but it sounds right. But yeah smokehound is dead on. 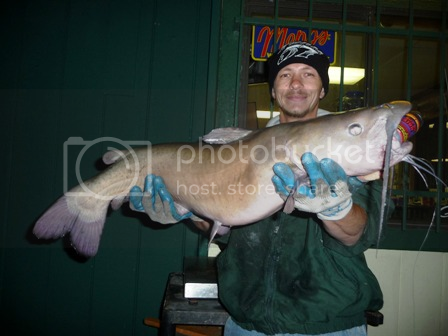 Catfish such as flatheads in particular will eat things like shad, small trout, minnows, etc. I once cut open a blue with some shad in its belly. Thanks for the post, TaperSteve. It has a lot of good suggestions in it. And here is the "but". But we should acknowledge that there is not a one-size-fits-all method of fishing for catfish any more than there is for any other fish. Fly-lining for catfish is fine if you can reach where the fish are without any weight. Cut bait is great if that's what they're taking. I have caught more cats on home-made dough bait than on cut bait. I can't see any reason to use a 5/0 hook in one of our local lakes. Sure, there are catfish big enough to take a mackerel head at Puddingstone for instance, but the ones you're likely to catch you can catch on a #4 or #2 hook. "J" hook, circle hook, wide gap, bait holder...there are a lot of hook choices. I for one would not leave my bail open while fishing at night. Could lose a lot of line before you had any idea what was going on. Maybe fishing a carolina rig with some slack to give the fish some running room. I'm not trying to start a fight; I'm just saying that there is more to catching catfish than can be described in one post. There are a lot of different approaches. For those just getting into it, there are dozens of web sites and fishing boards dedicated to catching catfish, and lots of different ways to go about doing it. You need to take into consideration the fish, the lake, current conditions, where the fish might be in the water table, depth you're fishing, and all kinds of stuff when you're fishing for catfish. Just my two cents worth. At most California lakes it is against the law to use live fish for bait like trout, bluegills, etc.... thus that is why I decided not to mention it. Catfish definetly love to gorge on live bait from time to time, too bad we aren't allowed to use it at most places in Cali. You mentioned many things that I plan on going in to details about in future tutorials. I was just trying to start off this first tutorial with a basic basic guidline one would need to go to just about any lake in California rather fishing from a boat or shore and be able to catch catfish. You talked about occasions when a weight is needed, as I mentioned in this tutorial I plan on going into details about multiple rigging options in a future tutorial. You also made mention that you have caught more cats on your homemade doughbait recipe than any cutbait. While I definetly plan on going over that in my future bait tutorial including maybe even a recipe or two, not everyone has the same recipe for a homemade doughbait that you use. If you have a killer recipe please do share I'm sure many of us would like to make it and give it a try. Many of the lakes in Cali have catfish up to and over 100lbs! For instance, a local paylake (Irvine Lake) hasn't started their catfish season yet but in the last month there has been over half a dozen blues and channels in the 20lb class that have been caught. Another fish broke the 30lb mark and that same guy caught one that was just under 50lbs in that same day. Some buddies of mine caught three of those 20+lb fish along with a few DD's and a bunch of 5-10lb fish to fill out their limits. I think their total stringer weight for the three of them (15 fish) weighed in over 150lbs! Most kits you'll find like this one all come in the range of 1/0 - 10/0 for catfish and if your using anything smaller than that you run the risk of a big cat straightening out the hook on you. As I said in this tutorial I plan on going over all the different hook options in my future tutorial covering rigging options. I for one would never use any type of hook smaller than a 1/0 for catfish but to each his own I guess. Like I said in this tutorial the main thing is to match the size hook to the size bait your using. Don't want to use a #4 hook on a large mackeral head hoping to catch the next 10+lb cat. Everyone has their own way of doing things, their own way they learned or were taught. Really there is no right or wrong, you might have an entirely different way of doing things that catches you fish. All I'm trying to do is pass along some friendly info on the methods that most catch me fish. Last edited by TaperSteve; 05-29-2012 at 12:20 PM. Last edited by Frequent Flyer; 05-29-2012 at 12:20 PM. Ohh man I can't wait for this summer! Yeah def if your fishing a body of water where you don't anticipate catching anything over a pound or two than maybe a small hook like that can work out. But on that note every lake has its record and you never know when that next lake record fish of a lifetime might find its way at the end of your line.